If your dog has ever had stitches, surgery, or just a really sore paw, you are probably familiar with the cone of shame. Dogs hate this ingenious device, but it provides an opportunity for fun for the resourceful owner. If you're a pet parent with an injured puppy, your dog is probably looking at you with those soulful eyes and begging you to take off the hated object. Don't give in (after all, the cone is there to protect your pet). But there are things you can do to help a pet be more comfortable and feel less restricted than with the usual cone of shame. What Is a Cone of Shame? What Is a "Cone of Shame?" Is There a Need for These Cones? The cone is also known as an e-collar or an emergency collar. It's an important medical device that fits around your animal's neck and keeps the animal from reaching areas of its own body it shouldn't be touching. The cone of shame is a humorous name given to the cone that reflects the way many dogs, in particular, look when they wear it: as if they may never recover from the shame of having it on. The term "cone of shame" was popularized by its use in the movie Up, where the cone itself became a trope in the relationship among the dogs in the movie. Since pets hate them so much, and since it can cause owners so much stress to use one, it's legitimate to ask whether the e-collar is really something we need to be using. Sadly for our animal friends, the cone, or something like it, is an essential medical necessity. When dogs and cats get stitches, their instinct is to worry and bite the area till they rip their stitches open. This can turn a simple surgery into a catastrophic emergency. When a pet gets a hotspot or some other itch, they can easily chew and scratch it into a huge, gaping wound. In this situation, it's much better to wear a cone than to suffer the stress, pain, an expense of the major medical issue. Unfortunately, many pets are very good at licking off their bandages. The bandages could be toxic to them or could be severely harmful to their digestion. Also, it is challenging to get bandages to stick to skin as furry as dogs and cats typically have. While some dogs and cats can be treated by putting an article of clothing over the wounded area, some pets are like another Harry Houdini when it comes to getting out of clothes or restrictions. In other words, nothing can stop them. If you hate the cone of shame, and so does your pet, there are some alternatives to using the hard plastic cones available at most veterinary offices. Even if you have already gotten a cone from your vet, it's possible that your pet has already destroyed it. Dogs, in particular, can be very diligent about destroying a thing they don't like. Here are some things you can do to make your cone of shame. The pillow collar sits around your pet's neck in the same way as an E-collar. These collars look very similar to the ones you and I might wear on a long flight. 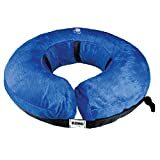 In fact, you may be able to use one of these travel pillows for your pets needs. The pillow collar needs to hold the pet's head in place, so it's not strained. But it also needs to prevent your pet from being able to turn around and reach the areas that it wants to scratch or lick. This means getting one that fits your animal fairly well, so you should take measurements of the neck before you buy. Look for pillows that are adjustable so that you can make it fit better if it needs to. Inflatable travel pillows can be better than soft ones for this application if only because it's less likely that your dog can get a bite out of it. The pillow collar is soft and comfortable for your pet. It's also easier to see compared to the cone, which means your pet is less likely to be made uncomfortable by you hitting the cone as you walk around during the day. Furthermore, the pillow collar won't destroy your house as your dog or cat wanders around wearing it. It is critical that this fit your pet perfectly. If it does not, your pet may be able to turn around and lick or chew its wounds anyway. It's also possible your pet might tear this up. Start by measure your pet's neck. Cut foam a bit longer than your measurements, to allow room for the foam's thickness. Remember that you can always cut more off, but you can't add it back on once you've cut it. Cut a sleeve out of the felt that will fit your foam. Use the needle and thread to sew the Velcro on so you can create a flap and secure the restrictor around your animal's neck. Sew all the rest of the edges closed to form seams. Then insert the foam. You can sew the foam inside, or you can leave that last seam open so the foam can be removed when you need. This is much more comfortable for your pet than a plastic cone, or even than a pillow collar. You can also personalize it to match your pet's personality or your own! It's also easy and cheap to replace the foam if it gets dirty or you have some other problem. This won't work for pets who need to be kept away from their front paws. It mainly works to prevent animals from getting at their back end or their stomach. If you have to get a sturdy collar and you need one right now, the bucket collar is for you. This is especially useful for dogs that are good at tearing up their vet-prescribed cones of shame. You'll need to find a bucket with a bottom that will fit comfortably around your pet's neck. Then all you need to do is remove the bottom, sand down the edges, so your pet doesn't get any cuts from sharp bits, and slide the bucket onto your pet's head. The bucket collar is simple and easy to make. It's also cheap and sturdy. If your pet can get out of regular e-collars or tear them to shreds, the bucket collar will stand up much better. This kind of collar is going to be a lot less comfortable for your pet. It may also, depending on the color and style, make it hard for your pet to see. This restricted sight could lead to other issues in the end. Sometimes you need an instant way to keep your pet from licking or tearing at something. When this happens, a cloth or towel collar is a great thing to use. If the towel is too long, you might have to cut some of it off. Fold the towel, so it becomes a flat, but have a long surface. Wrap this around your pet's neck and secure it with the wrap or even with tape. Don't worry about restricting breathing. Unless you have a very small dog or cat, you're unlikely to be able to wrap it so tightly that the pet can't breathe. The towel collar will keep your pet from being able to move its neck around and reach the rest of its body. It's soft, doesn't restrict sight, and won't tear up your house as your pet walks around with it on. It's also easy to make, easy to put on, and very cheap. If there's an emergency, you can make one of these very quickly. An animal can wear one of these around a week, but any longer than that and you'll want to watch out for the animal's neck. Also, the collar wrap may not be enough for certain animals, particularly some determined dogs. Also, this collar won't stop an animal from reaching its front paws. There are some alternatives to making your pet wear a cone of shame. For determined chewers, a bucket cone might be a good bet. To keep your animal more comfortable, a pillow cone or a towel cone can be a great choice. A neck restrictor is good for keeping your pet from reaching the back of itself without some of the disadvantages of other types of cones. Whichever you choose, though, just make sure that you always have your pet's best interests in mind. While you and your pet may hate the cone of shame, it's important that our pets be kept safe.